Value Added Consulting: 97% of clients would use The Nonprofit Center again and recommend it to others. Here’s why. When you hire The Nonprofit Center, you get The Nonprofit Center: A whole that’s even greater than the sum of its parts, with the client as beneficiary – provided by a consulting practice that works exclusively with nonprofits. As a nonprofit ourselves, we understand and value our shared culture and appreciate the unique challenges. We are value and value-added. We don’t dabble in occasional consulting projects, it’s our full-time passion. · Tools for enhance performance for the Executive Director and the Board, including one-on-one customized executive coaching for executives and board members that pairs each with a seasoned professional, who offers support in leveraging strengths and identifying barriers to improved performance, developing key learning and professional development goals, and creating the best path to accomplish these goals, succession planning to ensure the organization is in a position of strength to withstand a planned or unplanned leadership transition and more. What you won’t get is a quick fix, that is merely a band-aid that just masks or delays dealing the real issues. With us, you won’t be back a year or so later still wrestling with the same stubborn problems that were never properly addressed the first time. 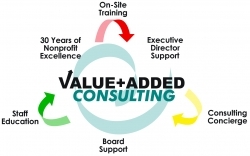 That’s the value-added plus of working with The Nonprofit Center and no single consultant can give you that. It’s up to you whether you want the experience of one, or the experience of many that you get when you work with The Nonprofit Center. With a 97% client satisfaction rating, we’re pretty sure we know the answer. Learn more about Expert Connections, our expert assistance package to answer your questions and get advice when you need it. -Jodi Button, Vice President of Community Impact and Development, The Montgomery County Foundation, Inc.